I am going to take a highly unpopular position and say that The Phantom Menace is not the worst film in this franchise. Certainly, Jar Jar is bad and the film killed Jake Illoyd's acting career but it is not nearly as bad as Attack of the Clones. Episode II is virtually unwatchable for a litany of reasons that I will discuss in a few moments. Honestly, in many ways the film is a step back to Phantom Menace, particularly from a technical and scriptwriting perspective. Time has not been kind to this film as I felt that my time would have been better spent sleeping than attending the midnight showing back in 2002... Or reading a book a decade later. I think is wise to forgo an explanation of the plot since really nothing too terribly exciting happens especially if I had to continually fight the urge to turn the film off. Now, you might thinking, it was not that bad Manny. 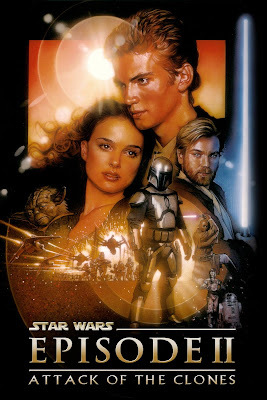 On the whole, it is a forgettable film (anyway you slice it) since the main focus is getting Anakin with Padme and expediting the conception of Luke and Leia. Everything thing else seems tacked on and a little forced. This highlights the main flaw of the film, George Lucas' script. Lucas is a pretty good at conceptualizing a story but when it comes to dialogue, he is somewhat lacking. 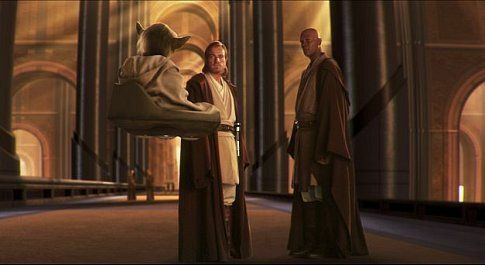 A certain line about sand comes to mind or any line from Anakin to Obi-Wan (although that could have a lot to do with the wooden delivery of Hayden Christensen). Honestly, I can live with many of the script related issues and poor dialogue choices (After all, I realize that I am not watching high art and I am "ok" with that). Yet, the my biggest gripe with this film is the extensive use of CGI sets. In the case of the Blu ray release (for this film) and its transfer, 99.9% of the film looks like a bad Playstation 2 cut scene. Call me crazy but a hundred and twenty million dollar film should not be subjected to such a bad transfer. 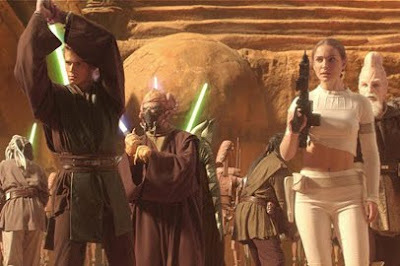 In spite of my negative tone, I did enjoy several things about this film such as seeing a bunch of Jedi fighting together or even seeing Yoda wield a lightsaber (since the kid in me never thought he really engaged in such things). By all accounts this is my least favorite movie of the entire saga and I have really only seen it twice. That kind of speaks volumes about how bad it is (especially since I have watched Episode I several times more than this one) and why it only serves as a poorly constructed bridge between films. I forgot to single out Ewan McGregor who went above and beyond in his portrayal of Obi-Wan. Note only did he channel Alec Guinness, he did the most with the little that was offered to him (from a script standpoint).